Grassroots art and music scenes are possibly the lifeblood of a city’s culture. The relationship between creative spaces, governmental bodies and urban developers has a definitive impact on their fortunes around the globe. The Creative Footprint is an apparent groundbreaking, worldwide collaborative project that will enable these communities with the information and resources to realise their potential against adversity. Spearheaded by Lutz Leichsenring (Berlin Clubcommission), utilising extensive research by Musicboard Berlin and Harvard University, and in partnership with Red Bull and Black Circle Media, the Creative Footprint is a non-profit initiative that measures and indexes urban creative space in the world’s cultural capitals, while advocating for art and cultural communities on the civic level around the globe. The Creative Footprint launched this week at the Music Cities Conference in Berlin. The city is the first of 10 worldwide that the project will study, engage, and ultimately award a score—its Creative Footprint - Berlin’s Creative Footprint is 8.02 out of 10. This number was formulated after data was gathered and scrutinised by a team of 50 local experts, before being crunched through a technology developed by Prof Daniel Polley and his students of Harvard University. 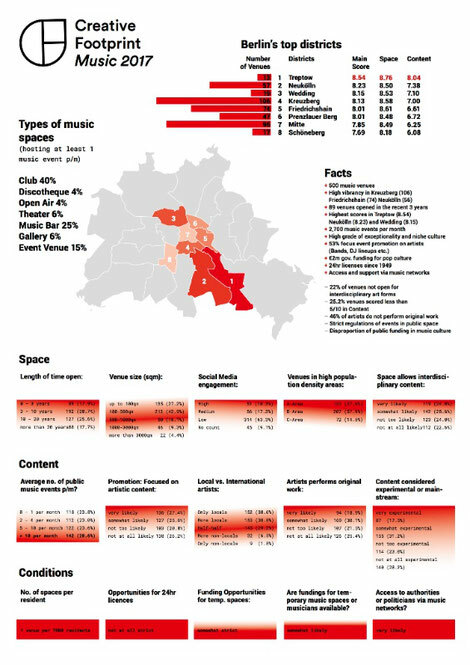 The vast dataset was analysed through multiple algorithms and provides deep and remarkable insight on the state of Berlin’s music culture. For example, it found that Berlin has 500 music venues— approximately one per 7,000 people— hosting an average of 2,700 events per month. The neighbourhoods hosting most venues are Kreuzberg (106), Friedrichshain (74) and Neukölln (56), with 43% of the programming in Kreuzberg considered to be “experimental” or “somewhat experimental”. The German capital has seen 89 venues open in the last three years. The Creative Footprint is also a content portal, offering in-depth editorial features and documentaries exploring Berlin’s position as possibly the world’s most vibrant music scene. Through interviews with pivotal figures like Dimitri Hegemann (Tresor), Sascha Disselkamp (Sage Club, Fiese Remise), Falk Walter (Arena, Club Visionaere, Ipse) and Steffen Hack (Watergate), it explores the sociopolitical and historical context in addition to analysing data of the present. Editorial landscapes and biopics exploring location as perhaps the world’s most vibrant music scene. Through meetings with pivotal statistics.